“To the fans. i want you to know that I care deeply about your feelings and views, and I will always support your philosophies about life. We’ve been having over-arching conversations about society, equality, and politics for the past five years, and we should continue. I do not however support violent, abusive, and childish campaigns for ANY CAUSE. Particularly one that I respect. “Animal Rights.” I am choosing not to comment on whether or not the furs I purchase are faux fur-pile or real because I would think it hypocritical of me not to acknowledge the python, ostrich, cow hide, leather, lamb, alligator, “kermit” and not to mention meat, that I have already worn. This should already put me in a category as one who appreciates and adores the beauty of animals in fashion, but am not a strict vegan. I have truly always stayed away from skinned fur, especially i have never been able to afford a nice one, but this does not mean my morals are rigid and that I won’t bend at the sight of an absolute art piece of a coat. I have no chains about this. You see a carcass, I see a museum pièce de résistance. But I am truly sorry to fans who are upset by this, its a fair and applaudable feeling about the health and safety of animals. I respect your views, please respect mine. Amen Sista! As a fur lover (faux and second-hand real because let’s get real here, real fur is expensive, and rightfully so), it’s nice to hear someone say something honest about wearing fur. And the last part is awesome about saving flour to feed hungry children. Classic. That’s the thing about PETA that has always baffled me, is that they are using threatening behavior and violence to bring about a point of non-violence towards animals. It’s hypocritical to the life they wish all humans to lead, one of non-violence towards all beings. If we can’t stop being dicks to fellow humans, our own kind, will we ever be able to curb our dickery with other species? It’s a question for the ages here people. 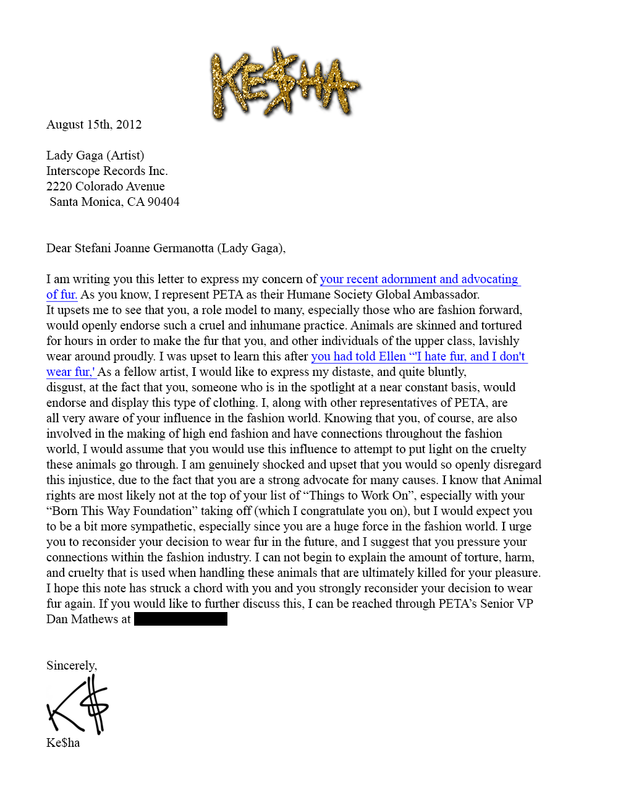 “I can be reached through PETA’s Senior VP…” Smug much! And kind of the whistle blower to the whole fake letter theory. Like anyone wants to talk to a higher up at PETA. They’d probably throw red paint on you just for interrupting their lunch of dried oats and frail greens. Hilarious. This is gonna get real good. Those PETA motherfuckers don’t back down. I will not be surprised at whatever violent tactics they partake in next. Let’s just hope they don’t pass out from too much exertion.